You can’t blame Gabriella Safran for finding a way to squeeze the name of S. An-sky’s best-known work, The Dybbuk, into the title of her splendid new biography. If An-sky’s name is remembered at all today, it is thanks to his landmark play, which tells the story of a dead bridegroom who returns as a dybbuk, or malicious ghost, to prevent his intended from marrying another man. An-sky wrote the play in Russian in 1913, but it was not until after his death in 1920 that it was actually performed. 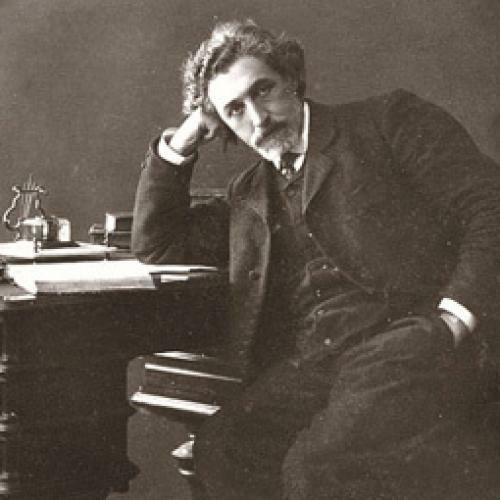 The first production, in Warsaw, was in Yiddish, and turned out to be a smash hit; two years later, the Moscow-based theater troupe Habima premiered the Hebrew version, translated by Chaim Nachman Bialik, and scored another success. After Habima moved to Palestine, later in the decade, it made The Dybbuk the center of its repertory, and the play is considered the foundation of modern Hebrew drama. Safran makes a convincing argument that An-sky was in flight from his sexuality. But it is certain that his rootless and “wandering” existence was an expression also of his ideas—of his revolutionary commitments. From the very beginning, Safran shows, An-sky was dedicated—like so many intelligent, idealistic Jews of his time and place—to overturning the social order, in Jewish society and in the wider Russian Empire. As a teenager, he went from one shtetl to another, earning his living as a Russian tutor while secretly indoctrinating his pupils in the tenets of Haskalah, the Jewish Enlightenment. He was expelled from a town after he lent a copy of Moses Leib Lilienblum’s subversive autobiography, Sins of Youth, to a student: the boy was reading it in the study house, hiding it under a volume of the Talmud, when he fell asleep and the ruse was discovered. An-sky began to serve the revolutionary cause by writing exposes of the situation of Russian miners, which he observed first-hand while working in a salt mine. In 1892, he followed in the path of many Russian revolutionaries by moving to Paris, where he spent the next eight years. He became a leading figure in the propaganda division of the Social Revolutionary party—the leading revolutionary movement in Russia, and the chief rival of Lenin’s Social Democrats. As a Jew and a socialist, An-sky was of course galvanized by the Dreyfus Affair, which he wrote about voluminously: “I’m no longer myself, but the Drefyus Affair, covered in a thin layer of skin,” he joked. In 1901, he moved on to Bern, another center for Russian conspirators, and like many of them he was drawn back to the motherland by the revolution of 1905. For An-sky, as for the revolutionary movement as a whole, that year was a turning point. When a series of strikes and revolts forced the Tsar to grant a constitution and create a parliament, it seemed that a new dawn was at hand. “Now every day is a year, every hour a phase,” An-sky wrote. “The revolution will go on in bloody paroxysms and will pull out its rights in pieces from the bloodied innards of absolutism.” But by the time he made it back to Petersburg, on the last day of 1905, it was already clear that the Tsar’s concessions had been made in bad faith, and the counter-revolution was beginning. It often took the form of pogroms against Jews, as nationalist groups encouraged by the monarchy vented their wrath on Russia’s traditional scapegoats. His desire to reconnect with a more “authentic” Jewish culture led An-sky to the biggest project of his later career. This was the famous Gintsburg Ethnographic Expedition, named for its rich patron, which set out to record the beliefs, arts, and folkways of traditional Eastern European Jews. It was a self-consciously scientific enterprise, inspired by recent ethnographic studies of Siberian tribes, and it used the most up-to-date techniques. An-sky and his two colleagues visited small Jewish communities equipped with cameras, a phonograph, and a detailed questionnaire. In his pursuit of facts and artifacts, he was quite willing to run roughshod over Jewish taboos—in one shtetl, he even dug up skulls from a cemetery. But An-sky was not just a detached researcher: he was a seeker, in quest of his own origins and traditions. When he used the folktales he collected as raw material for The Dybbuk, he was putting into practice his own theory that modern Jewish art should grow out of traditional Jewish soil. “We would exchange the grave of the Besht for a good Jewish Leonardo da Vinci,” he wrote, jokingly but sincerely. When revolution returned to Russia in 1917, An-sky’s hopes were dashed once again. He saw the Bolsheviks commandeer the government from the more popular SRs, and ended up fleeing the country for Vilna and Warsaw, where he spent the last months of his life. When he died, in November 1920, the funeral procession reflected the strange variety of his career: the thousands of mourners included socialists and Zionists, actors and journalists. “If this restless soul could have seen his own funeral,” Safran concludes, “he might have been satisfied at last.” He would also be gratified to know that, even after a century, he was still able to inspire such a rich and lucid biography. Adam Kirsch is a senior editor at The New Republic. This review was originally featured in Tablet.